If you want to get in touch, please contact us at james@vocularapp.com. If you have a question which may have been asked before, be sure to check out our Q&A section. This is updated whenever a new and important question is asked about the software. Any update on when the Android version is going to be released? Seems like a really useful tool. Thanks, I think it’ll be next month when we have the Android version out. We’re currently doing work analysing the huskiness of voices, since that tends to be the most attractive feature. I’ll let you know when it’s out. So is the Android App going to be released soon? I am really curious about it. I really want to see this app. I just found out about it today and I am wondering when it will be released. I am willing to pay for it . Also I wonder how monotone NFL head coach would Bill Belichick would be, I think he would be the most monotone person. Agreed – would love to get the Android app! Hey James! Any developments in the android version of Vocular? I saw the last comments but the app isn’t out yet. When will you release it? Any time stimatives? Yeah, I actually have it on my Android, we’ve just got to fix a bug which makes it quit sometimes when the user ends a recording. Should be out in a few days, give or take however long it takes Android to approve it. Hello, I am singer that is looking to lower both my speaking and singing voice. Would this also lower my singing? I downloaded the app and the only option I had was to pay $1.99. Is that the pro version? If not will you be including that for free or charge additional amount? Hi Raj, we’ve now merged the Pro version with the original, so $1.99 is the only payment. Hi could you add Chris Hemsworth and Vin Diesel to it please? Hey Chris, we actually already have Diesel in the database. Hemsworth’s a good shout, I think I missed him off because he’s more famous for speaking in an accent which isn’t his own, but he probably doesn’t change his pitch when he does this. I’ll add him in the next version. Tom Hardy too. How can I get to the exercises? I’d start doing the neck exercises, but bear in mind that your neck becomes weaker and more tight before it gets stronger, so your voice should get higher for the first week. Let me know if you need clarification on anything. Could you please elaborate on this? Check the screenshot. It says my voice depth is 79hz, but average is 90hz and median is 90hz and mode is 90hz, and highest is 114Hz? 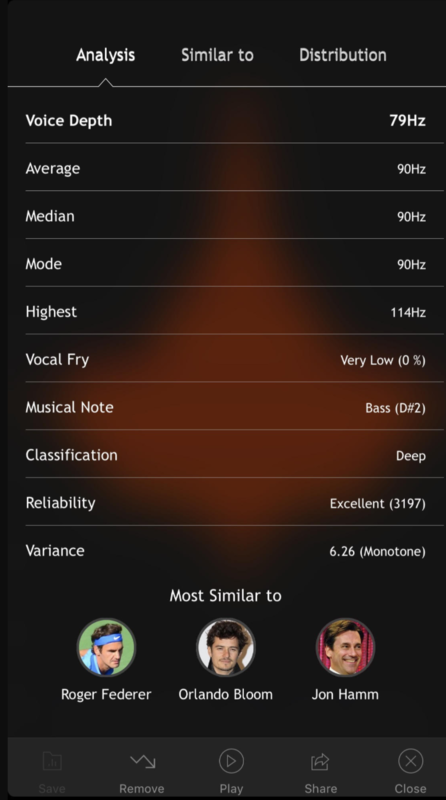 So if that is the case why is my voice depth indicated as 79hz? Is the calculation correct? The image above illustrates what I mean. Hey John, yup, the Voice Depth refers to the lowest significant note in your voice. If you check your distribution, 79Hz should basically be where your frequencies end. I added it because I was concerned that people who spoke with rather varied tones would be reported as having higher voices than they actually do, although, as it turns out, people tend to rate more monotone voices as being deeper. If you click on each line of the Analysis, you should get a brief explanation of what each parameter refers to. Let me know if it’s not working for your device though and I’ll look into it. I’m getting a 62 avg score, which I’m taking to indicate deep, low sound. But I definitely have a higher pitched voice. What could be happening? Well, what makes you so sure your voice is higher pitched? One shortcoming of the app so far is that it doesn’t account for nasality at all, and there are guys out there like Richard Ayoade who literally have low-pitched voices but their nasal quality raises the frequency of some formants and makes their voices sound higher. Do you think that could be going on with you?